The Leadfoot Foundation, race car driver Brian Olatunji's personal charity, is a non-profit organization whose purpose is to empower youth to excellence by enhancing ones vision and goals for their life through mentorship and education initiatives. Brian Olatunji’s passion for hot cars is equaled by his passion for providing kids with the resources necessary to achieve their God-given potential by receiving a good education. 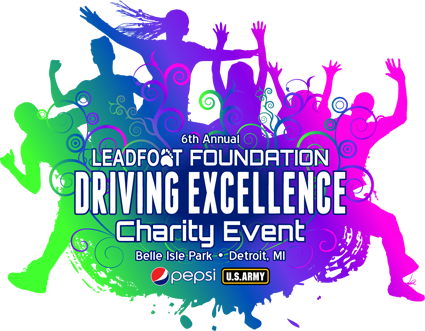 Olatunji, a 15-year drag racing veteran and the Leadfoot Foundation, Inc. will again demonstrate their support for Detroit youth on Tuesday, Sept. 4, 2012, at the Jalen Rose Leadership Academy when his Leadfoot Foundation distributes educational supplies to each of the school’s 240 students. They will receive backpacks filled with supplies on the first day of classes to help ensure they will be successful throughout the 2012-2013 academic year. Distribution of supplies will take place from 11:30am – 1:30pm at the academy, located at 15000 Trojan St. in northwest Detroit. “Our goal is to give back to the very community from which I came,” said Olatunji, a native Detroiter who races on the National Hot Rod Association (NHRA) Funny Car circuit. Olatunji is president of the non-profit Leadfoot Foundation, which has donated back-to-school essentials to Detroit school children for the last six years. Over his racing career, Olatunji has competed in a variety of NHRA categories from Super Gas to Top Alcohol Funny Car. This season he is again at the wheel of the Leadfoot Motorsports primary race car. A film crew from the upcoming SPEED series Dreams 2 Champions will be on hand Tuesday at the Jalen Rose Leadership Academy to cover Olatunji and the Leadfoot Foundation’s charitable efforts. He is the subject of a new reality series on the network that’s designed to reveal what it takes to make it as a professional racecar driver. The show is scheduled to debut in November. DONATE: Please give $10 or more in unopened school supplies. Click here for a list of suggestions. Or you can give a financial contribution by using the PayPal button below! Thanks to everyone for your contributions, they are much needed and appreciated! © Copyright 2018 Leadfoot Foundation, Inc. All logos and images are reserved. Contact Us.